Sarah Common (BSc Global Resource Systems 2009) is the co-founder of Hives for Humanity, a non-profit society, based in Vancouver (www.hivesforhumanity.com). The organization works to connect people to nature, their community and to themselves, through apiculture (more commonly known as beekeeping). What drew you to the Global Resource Systems (GRS) program and what did you choose to focus on? 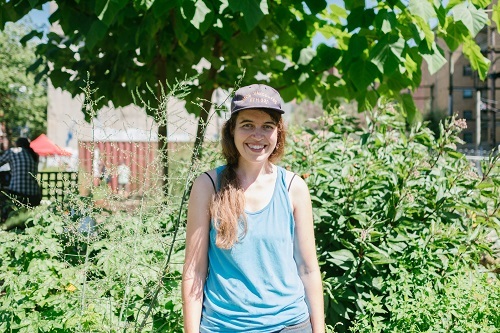 After beginning my undergraduate degree abroad, I came back to Vancouver wanting to connect locally with community through land and food. The flexibility of the GRS program gave me the time to find my focus, and I ultimately chose the issue of food security in the downtown eastside (DTES). Where did the idea for Hives for Humanity come from? What’s the focus of the organization today? The heart of our work is in therapeutic mentorship of at-risk communities in the art of beekeeping; we work to empower folks facing barriers to stability to alleviate poverty, foster self-worth and community pride, and to share and teach skills through experiential education. We currently have therapeutic apiaries (‘bee yards’) at 19 locations in the city, through partnership with other organizations and businesses. Each location’s apiary and programming is designed in collaboration with the staff and community members and responds to their specific needs and opportunities. We also facilitate creative and welcoming workshops and mentorships that build skills, enhance teamwork, and provide wellness and connectivity, for communities ranging from after-school care groups to corporate volunteer groups. Through all of this we aim to change the way we think about bees, people and ourselves. There is hope in the darkness; there is opportunity for inclusion, accessibility and sustainability. If we can connect through our shared humanity and listen to the voices of others, then we might honour the vast network we are all a part of, and build reciprocal relationships of respect and dignity for all.